The Red-lored Amazon is a very attractive parrot, and simply loved for its "pretty face"! The colorful face of the Red-lored Amazon Amazona autumnalis, also called the Yellow Cheek Amazon, has inspired many enthusiasts to proclaim it the most beautiful of the Amazons. it is readily apparent from this birds pretty face that these common names are quite fitting. Which ever name you prefer, the lores (and forehead) of this decorative Amazon are definitely red and its cheeks are definitely yellow. This beautiful amazon is a pleasant, social parrot that enjoys its human companions. The Red-lored Parrot has an amiable personality, displaying less aggression than many of the other popular amazons. It is regarded as a wonderful pet bird that is gentle, affectionate and loyal. The Yellow Cheek Amazons are intelligent pet birds, quick and humorous at play, and you will enjoy their comical antics. In the wild the Yellow Cheek Amazon is quite noisy within its flock, but in captivity it has been noted that they tend to be much quieter. Still this Amazon can be loud at times. Like all Amazons, they will call out an alert first thing in the morning and then again as the sun is setting. These two periods of the day usually last for about 10 minutes. Yet although the Red-lored Amazon parrots can be vocal they are not considered to be the best talkers. Depending on the individual bird, some will be good talkers while others will only say a couple of words. The Red-lored Amazon parrots are very social and enjoy the company of people as well as other birds. They will form very strong bonds with their owner, becoming fast friends and exhibit total confidence. They are also a hardy robust bird and can do well in either a cage along with an out-of-the-cage playpen, or kept in an aviary. Distribution The Red-Lored Amazon Amazona autumnalis was first described by Linnaeus in 1758. It is also called the Yellow Cheek Amazon and Red-lored Parrot. Red-lored Parrots are found in Central America from eastern Mexico to the peninsula of Belize, Guatemala, and Honduras. They live in tropical zones where they inhabit the canopies of woodland and forest trees, and mangroves. They live in groups that can be small with as few as six birds, to large with up to a hundred birds, and form monogamous pairings during mating season. They feed on fruits, nuts, berries, seeds. and the blossoms and leafy buds of treetop foliage. Status The Amazona autumnalis is on the IUCN Red List for Endangered Species as Least Concern (LC). 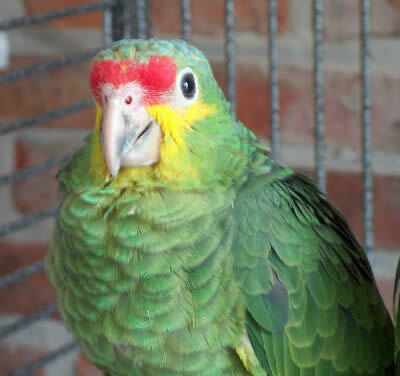 Description The Red-lored Amazon or Yellow Cheek Amazon has an overall green coloring. The lore and forehead are red, the crown is blue, and the cheeks are yellow. The wings are a spectacular array of color; green with red in the middle and blue on the outer edges and on the tips. The eye is dark brown with a white ring around it. The beak is gray but with a yellow horn color on the upper portion and the legs are greenish gray. Juveniles will have less red on the lores and forehead, the cheeks may have some green, and the eye is orange. They become sexually mature at about 3 - 4 years. Mature birds are about 13 1/2 inches (34 cm) long from the top of the head to the tip of the tail. Their average lifespan is 40 to 60 years. Care and feeding In the wild these birds eat fruits, seeds, nuts, berries, blossoms and leaf buds, as well as enjoying some palm fruits. A pet bird will enjoy a varied diet, including a quality seed mix or a pelleted diet, and many fresh fruits and vegetables. Pellets will work if started at an early age. Plenty of human food that is nutritious can be offered. Avocado and chocolate are toxic to any parrot. Housing A roomy cage is required for the Red-lored Amazon. They are very active birds and need to spend a good deal of their time outside of their cage or can be housed in an aviary. A cage must not be too confining, so get one that your pet will be able to feel comfortable in. It is recommended that a cage be 2 x 3 feet wide and 2 1/2 to 5 feet high, and with a play pen top. The Yellow Cheek Amazon likes to climb and play, and enjoys expanding its wings. It loves to be out of its cage on a playpen, and will enjoy interacting with their human as well as playing with toys. A hanging perch above the playpen is a great thing to have for climbing. Don't forget bathing. Spraying your Red-lored Parrot with warm water or a commercially available bird bath is necessary to keep the feathers from drying out. Social Behaviors In the wild, the Red-lored or Yellow Cheek Amazons are very social birds. They are usually seen in groups, but with some distinct pairs in the group. Groups can be small with as few as six birds, to large with up to a hundred birds. These are social creatures, they like to be greeted when you come into the room. The more your amazon is around people, the more socialized it is and the more it will interact and play with you. You will establish a greater attachment between you and your feathered friend the more you are together. Handling/Training The Red-lored Amazon will adapt fairly rapidly, becoming accustomed to a new environment and its keeper. It is then ready to start bird training. Generally though, you should give a new arrival a few days to get use to you, your voice and its cage before trying to handle it. A hand fed baby will not need much taming and can often be handled right away, as it is use to human attention. Activities The Red-lored Parrot is a very active amazon. It needs a lot of time out of its cage to stretch its wings, although climbing seems to be its favorite activity. It needs plenty of toys to keep it busy, and a hanging perch is thoroughly enjoyed. A moveable perch that can follow you around the house is also great. This Amazon likes to play, loves to wrangle with toys, and is quite an acrobat. They entertain themselves quite well and you will enjoy it. Sexing - Sexual Differences The Red-lored Amazon or Yellow Cheek Amazon is not sexually dimorphic. Females look like males. If gender identification is important (for example for breeding birds) DNA / Feather or surgical sexing is recommended. Breeding/Reproduction These amazons were first bred in captivity in the United States in 1956, but breeding successes have been variable. They become sexually mature at about three to four years and may raise more than one brood per year. They become sexually mature at about three to four years and may raise more than one brood per year. The sexes must be confirmed and the pair must be harmonious, bonded with each other. They will need a nest box that is 31"-39" (80-100 cm) high with an inside diameter of 12"-14" (30-35 cm) and an opening of 4"-5" (10-12 cm). Provide some soft bedding material inside on the bottom of the box. The hen will lay two to eight eggs which incubate for about 26 - 28 days. The young will leave the nest at about 12 weeks. As with many parrots, the male will eat for both himself and the female while she incubates the eggs and feeds the young. The male regurgitates the food for the female to eat. He gets a lot less picky about what he eats at these times! If you notice any of these bird illnesses in your Red-lored Amazon, immediately provide a warm, draft free, secure environment kept at about 86°F (30°C). Place food and water close to the perch where it is easily accessible. An ailing parrot should be taken to a avian veterinarian for diagnosis and treatment. Availability The Red-lored Amazon or Yellow Cheek Amazon is occasionally available in pet stores or from breeders in your area. Animal-World References: Pet Birds - Exotic Birds. I have a red front amazon lord he is crazy and get's into alot of trouble runs around all day and plays has lots of toys and places to climb on he eats every meal with us and also has his food. I gave him the new round balls that are suppose to have all of the stuff he needs he won't eat it unless I put it with his regular seeds that he was brought up on. I also make him his own eggs with shells crushed up in it like I was told to do and got him that mix that you feed them from the store that you cook for them. He is very lean and the women that cuts his wings says he is too skinny does anyone no anything else that I can feed him to get a little weight gain on him? Please contact my email account if anyone has an idea thanks alot for your advise morgan really appreciates it. You didn't mention how old your little fella was but it takes them about a year to year and a half to obtain solid body weight. Nuts are high in fat content and will put on weight. They are also good for them. Almonds are an excellent source of Vitamin A. A huge research center (ARBC) stated in a book they wrote that walnuts were the perfect source of food for parrots. You have to crack them for him. So I don't know his age but it sounds like you are feeding him well - You might add a few pellets - and things like peanut butter and a little honey on a cracker won't hurt. he can eat anything you eat that is nutricious. So skip the chocalate and avocado is toxic but if you have meatloaf and mashed potatoe - he can have some. Amazons are not supposed to be havy but yes they should be solid. You can always feel the breastbone though. Thank you very much for answering me I haven't been on the computer I broke my leg so it was hard for me to get around which morgan loved because I stayed with him constantly. When I was in the hospital for three days he wouldn't hardly eat but as soon as I got home he was in my mouth eating my food instead of in his bowl he was very stuck to me like glue for a few weeks. He is now 6 years old has put on a lot of weight but as you said you can always see his breast bone. He does seem skinnier then other red fronts but not that much he eats like a pig but I always have to stay with him and not even move out of my chair or he stops eating. He is way too attached to me. People get mad at me because I don't like to go anywhere for a full day because I'm afraid he won't eat right I guess if he gets hungry enough he will eat. I am going to bring him to another place in petsmart that has a vet in it and see what she says when I get his wings clipped. The way he runs around the house after me he probably runs all his weight off. Thanks for getting in touch with me, I will be on more often now. My Morgan is now 11 yrs old he has gotten big and still is lean, the dr, told me it's because he always runs around the house all day plays fetch with his own phone that I had laying around he is very strong and still does once in a while bite me when I come home from grocery shopping,fisjing doctors or any place that takes time away from him. He has the run of the house and doesn't bite the wood except for his wooden ladder it's very good to get one for them they like to chew wood so I just clean it up when he is done and pretty soon will have to buy him a new one it was 36" long and now has it down to 22" I just cut off the piece that is chewed and he just keeps biting.Would rather him bite a $16.00 ladder then the wood around the house so take that advise from me it will help your furniture. Good luck hope you have as much fun with yours as I do with my baby boy. Beardsley is almost 37; I got him when he was 7 months. I was told he was an Orange Cheek Amazon from the Red Lored family, but he looks just like the pic of the Red-lored Amazon. I was wondering what kind of branch/stick I can give him for chewing. He loves to chip and pick at my wooden furniture, but he is destroying them! Any suggestions? I owned a red lored for 30 years and found that he loved to chew up balsa wood. Give him 1" by 1" squares and he will love chewing them into tooth picks.